Zara Phillips, is an author, professional speaker, recovery specialist, singer, performer & a nationally recognized speaker on both adoption and addiction issues. Zara Phillips began her professional career working as a backing vocalist for, Live-Aid creator, Bob Geldof. Zara’s book “Mother Me” has been published in both the U.S and the U.K, and is her own poignant and personal journey of growing up adopted, reunion and motherhood. Her documentary “Roots Unknown” features the stories of the adoption triad and is recognized as a highly effective teaching tool by the adoption community. Her acting debut in the highly acclaimed off- broadway play and one woman show “Beneath My Father’s Sky” depicts the intricate and very complex relationship adoptees experience with the birth father identity and was awarded best direction at The United Solo festival in NYC. She also wrote and performed the hit single with RUN DMC Darryl MacDaniels,( a late discovery adoptee himself) “I’m Legit”. Zara shares her personal recovery from addiction and adoption issues as an inspiration to help others seek healing. 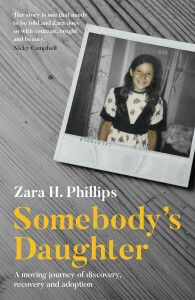 Zara’s new book “Somebody’s Daughter”, published by John Blake/Bonnier Publishers, is coming out February 22nd in the UK. More information to come about this moving journey of discovery, recovery and adoption. In London and the UK, Zara Phillips is represented by London-based Kruger Cowne talent management agency. Please do call Kruger Cowne at +44 (0)20 31241860 or use the form on Zara’s profile page there.